Ah Mu Academy dominated in the Get into Rugby tournament that was held for private schools in Upolu at Pesega. The schools are Pesega Middle School, Robert Louis Stevenson School, Peace Chapel, Ah Mu Academy, Samoa Primary School and Vaiala Beach School. Ah Mu Academy claimed first overall in the Year 5, 6, and 8 divisions while Samoa Primary School took the Year 7 division. Peace Chapel Year 8 teacher, Cassandra Hart, said all the private schools have enjoyed what the Samoa Rugby Union (S.R.U.) has been doing with coaching. “It is really important for the private schools to be involved because it encourages team work and participation in such and amazing game,” she said. 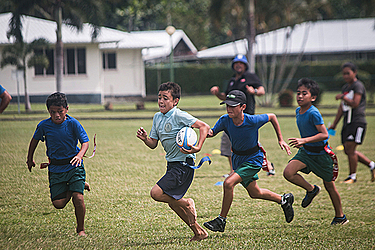 Get into Rugby coordinator, Filoi Eneliko, said the programme is running throughout all of Samoa, not only government schools and mission schools but also private schools. She added that this is a sport to develop the skills of rugby for children.